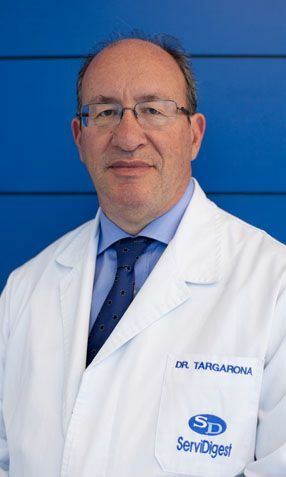 Eduard Mª Targarona Soler MD is a Specialist Physician for Bariatric Surgery – Surgery for Obesity at the ServiDigest Clinic in Barcelona. Integrated Medical and Surgical Service for Obesity at the ServiDigest Medical Centre in Barcelona. Specialist Doctor in General Surgery and Digestive Surgery from the University of Barcelona. Registration nº 13882 at the Official College of Doctors of Barcelona. Continuous training with participation and attendance of courses and the most relevant congresses on Bariatric Surgery. Member of the main scientific societies related to the Bariatric Surgery – Surgery for Obesity specialisation.